The Sandford was first introduced in 1922 in Paris (France). 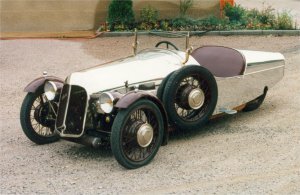 Designed and built by Stuart Sandford the Sandfords became highly successful at Time Trials and races beating most 4-wheelers of the time. Many variations of the Sandford was produced that included numerous racing models such as the Sport, the Super Sport and the Super Charged Sports. In addition a Family model and Tourisme model were also introduced. With exception of the Economy model (FT5) that had a 950cc Ruby engine all Sandfords were powered by 900 - 1100cc water-cooled, four cylinder Ruby engines. Production of the Sandford halted in 1936. None known of by this web site.